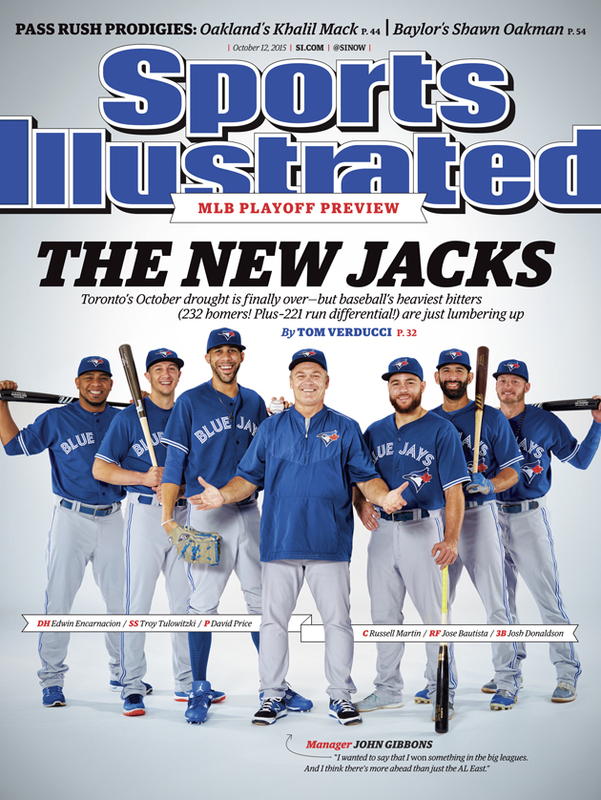 The playoff-bound Toronto Blue Jays are featured in a Sports Illustrated cover story by Tom Vercucci. With the MLB playoffs set to begin on Tuesday, this week’s Sports Illustrated cover features Toronto Blue Jays designated hitter Edwin Encarnacion, shortstop Troy Tulowitzki, pitcher David Price, catcher Russell Martin, rightfielder Jose Bautista, third baseman Josh Donaldson and manager John Gibbons. In SI's MLB playoff preview issue, Tom Verducci writes about the end of Toronto’s 22-year playoff drought. The Blue Jays are playoff-bound for the first time since winning the 1993 World Series—when they also appeared on the cover of SI—after earning a postseason berth by overtaking the New York Yankees for this year's AL East crown. Toronto finished six games ahead of the Yankees with a 93–69 record, which was the second-best record in the American League behind the Kansas City Royals (95–67). Despite their postseason inexperience, oddsmakers have given the Blue Jays 3–1 odds to win it all. The Royals and the St. Louis Cardinals come in at 5–1. The Blue Jays will kick off the ALDS on Thursday at home against the Texas Rangers. Price, who finished the year with a 2.45 ERA and an 18–5 record, will start Game 1 for Toronto. Price went 9–1 with a 2.30 ERA in a Blue Jays uniform following his mid-season trade from the Detroit Tigers. This week’s issue of SI also includes stories on Oakland Raiders defensive end Khalil Mack, Baylor defensive end Shawn Oakman and a profile on Cardinals manager Mike Matheny.